“You probably never give skin a thought,” writes Anita Sanchez, “until it gets itchy.” And then you can’t stop scratching. But to understand why things itch, we need to understand how skin works and how our body reacts to stings and bites. 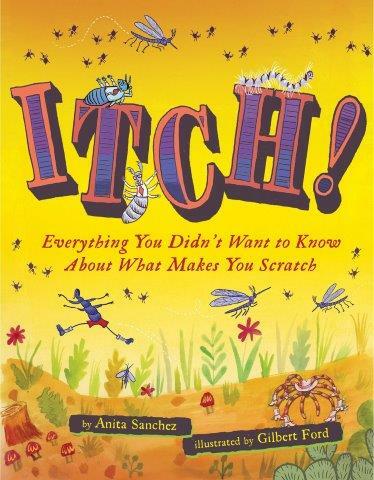 In the following chapters, we are introduced to things that make us itch: lice! fleas! mosquitoes! bedbugs! fungi! and plants with spines, needles, and poisons. Yes – there are things lurking and growing in our backyards that will make us itch. What I like about this book: it’s fun to read and full of unexpected (and cool) facts. Even as she describes the pesky plants and bugs that bother us, Anita offers cool insights into their lives. We learn how fleas leap, how burrs inspired velcro, and how bedbugs talk to each other. Even better, she provides plenty non-toxic alternatives for treatment. Did you know that a dab of minty toothpaste can soothe an itchy bug bite? She’s even got a recipe for de-skunking! The writing is clear, and the illustrations engaging and sometimes humorous. I like the back matter, too: an author’s note about the inspiration for this book plus the usual glossary, bibliography, and an index that’s like having a quick-link to info.